Today: Life is difficult, but your salad greens don't have to be. Meet chard: a laid-back, carefree, whatever whenever kind of vegetable. Remember that friend from college that would be like, “Yeah, sure, I'll go downtown and wait with you while you deal with your parking ticket," and then you had a really good time standing in line, and afterwards you got sangria at that Spanish place you always wanted to try? 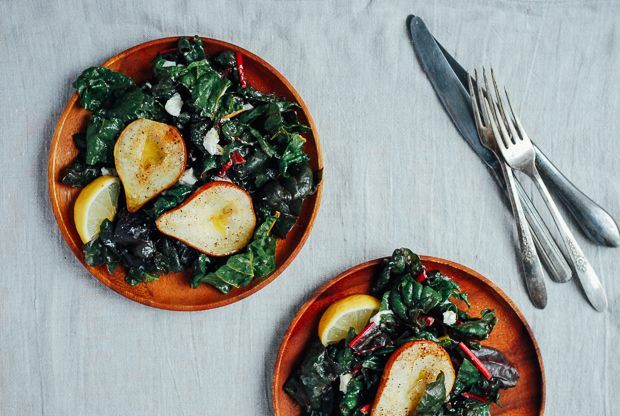 That's chard: a chill ingredient that's up for pretty much whatever. It's fine with cool weather, but hot weather's okay, too. On the West Coast, it's always in season, but even in slightly colder climates, chard is still around eight months of the year. The leaves are tender enough to be eaten raw, but if you want to sauté it like spinach, that's great, too. If you'd like, braise chard as you would collards -- that also works. You can chop up the stems and treat those like celery, or just throw them all in with the leaves. Anything's fine with chard. And while it doesn't have a strict season, this is the moment to spend some quality time with chard. Summer was full of good-time friends like tomatoes and corn that needed next to nothing in the way of prep, but they're gone now, and winter is full of tough leaves and roots that needs tons of attention. 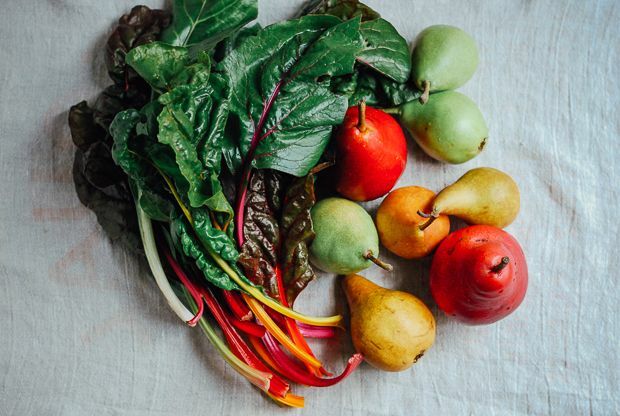 Chard is one of the last easy vegetables you're going to see until spring. Here, I paired it with a mix of pears: the anti-chard. 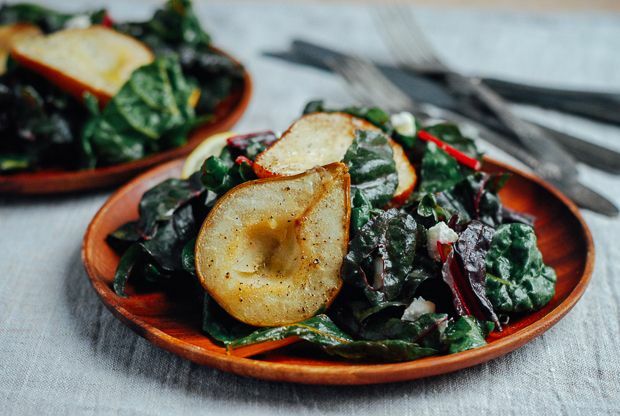 If chard is ready for whatever whenever, pears are at their best during a 15-minute period in which they pass from underripe to way-too-ripe. That's their game. To beat them at it in this salad, I take some that aren't quite ready to go and I roast them, which teaches them a lesson and makes them sweetly delicious to boot. Mild and faintly tart, the now-submissive pears are just right for enjoying with the supple leaves of rainbow chard, creamy chèvre, and a simple lemon vinaigrette. LOVE those ideas. I'm actually allergic to tree nuts, but walnuts sound divine. Love the beets too. And thank you for the kind words –– so exciting to have so many excited about chard! Thank you for yet another way to use this wonderfully versatile, totally amazing super food. My garden would not be without it. It is also delicious, (& nutritious) to chop up & add to hearty soups. I'm anxious to try this recipe with the roasted pears & plan to try with sauteed apples, too. My compliments to the Chef! Hi Tara, Chard's the best, right? I'm totally saving some for a hearty soup. I think apples would also be amazing with chard. Appreciate you dropping by! I want a friend like chard. I like to teach my pears a lesson, too. Right on. The things is, pears are still worth it for that 5 minutes of total perfection.